Daniel Boyarin’s study of martryology in late antique Judaism and Christianity has been one of the most enduring legacies of his scholarship. A recently published study by Paul Mandel on the martyrdom of R. Akiva in rabbinic texts raises some questions about Boyarin’s readings, and it is accompanied by a lengthy Appendix on the matter (available here with permission from the author and publisher). The Talmud blog is honored to provide a space for Professor Boyarin to respond. My teacher, Prof. Saul Lieberman, May the Memory of the Righteous be for a Blessing, used to say that the proper Festchrift for a senior scholar was one in which his students and colleagues corrected all of the errors he or she had made in his work over the decades. I begin, then, by thanking Prof. Paul Mandel for catching and correcting an important error in my work, one that was, moreover, compounded by successive revisions of the argument in which the initial error was never corrected until quite recently. I also wish to congratulate him on a very important and largely compelling article. Let me step back a moment and fill in the background here for those who might not know of what I speak. Mandel recently published an important article (“Was Rabbi Aqiva a Martyr? 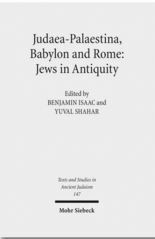 Palestinian and Babylonian Influences in the Development of a Legend,” in Ronit Nikolsky, Tal Ilan eds, Rabbinic Traditions between Palestine and Babylonia (Brill 2014)) in which he argued that in the Yerushalmi and in the earlier stages of the Bavli’s transmission, the story of Rabbi Akiva’s death [Berakhot 61b] is not portrayed as a martyrdom but as something he calls a “political drama” (It’s not clear to me how a martyrology is ever not a political drama, but nonetheless). The important evidence is that in the earliest forms of the text as preserved in one family of Bavli MSS, significant markers of the martyrological character of the story are missing, only to be added in later families of manuscripts to Massekhet Berakhot. The argument, and it is a quite compelling one, leads to the conclusion that the martyrological elements in the story are a later addition, perhaps—even probably—is added to the story in the Byzantine era and under the impact of Christian martyrological literature. As I’ve said already, by and large, I find this article convincing. The conclusion, of course, invalidates my own interpretations of this story in its form as a martyrology as late-ancient and intimately bound up with the formation of the very notion of martyrology as a Jewish/Christian co-invention in the third and fourth centuries. One is always sorry to lose a treasured reading, but זה בונה וזה סותר,כך דרכה של תורה. The work lines up with other analyses of this type (including at least one of my own) in which we see that notions that we ascribe to the Bavli are really the product of late stages of transmission of the text and the earliest forms of the Bavli-text as found in manuscripts line up much more closely with the Yerushalmi. Indeed, Rabbi Akiva may not have been fully understood as a martyr until some time later than we thought, although it may not be gainsaid that there are martyrological moments even in the earliest Bavli transmissions of the story. As said, Mandel is to be congratulated on this achievement. He, however, devotes quite a bit of time in the article, and especially in an appendix, discussing an egregious error that I made in doing my own work on this topic, and it is this aspect that I would like to take up here. First off, as said, of course he is right. When I originally translated this text, I simply skipped an entire line in transcribing from the Vilna edition of Berakhot, a regrettable error in its own right, especially since the line that I skipped strongly supported my interpretation of the story. In the hour that they took R. Aqiva out [to be executed], his disciples said to him, “Our master, so far? [i.e., is this necessary]. I cannot, for the life of me, see how the addition of the elements of Rabbi Akiva being flayed alive, nor that the moment was the time of the reading of the Shema, detract one iota from the martryological interpretation of the story as it appears in the textus receptus. The students, nonetheless, see their teacher being flayed, a grisly form of execution, and ask whether it is necessary that this awful thing happens, to which he answers, yes. Rabbi Akiva, moreover, prepares to accept the yoke of the kingdom, i.e., his tormented death, at this very moment by reciting the Shema, as it happens. It is trivializing of the story in the extreme to make the disciples question a merely halakhic one: Is it necessary to read the Shema at such a time? Their question remains directed at the master’s impending death as well as present pain. His answer is precisely that through the recitation of the Shema at the time of being tortured and killed, he fulfills the mitzva of “with all your soul.” Had the addition of the line I inadvertently skipped been lethal for my reading, this would have been a much more important error than it is. I cannot see, however, how adding the detail of Rabbi Akiva being flayed alive (certainly a martyrological trope) or the moment being the time for the reading of the Shema detracts from the martyrological reading of the textus receptus. If anything it surely enhances that character. אמרתי: מתי יבא לידי ואקיימנו? Any way that it is construed then, the textus receptus surely describes a desire for martyrdom on the part of its hero protagonist, with or without missing lines of text. Despite having little effect on the interpretation of the passage in the textus receptus, it remains a regrettable error nonetheless. The same error was repeated, moreover, in three other publications about this narrative both in Hebrew and in English over the years. I am chastened and embarrassed. More egregious than that is the evident fact that even when I claimed later on in one of the publications to be citing from a manuscript, the error persisted, so once again the work was sloppy at this point. I had clearly been reading the MS at the time of the later work, as a large new chunk of text considered there was copied from the MS. At that time, moreover, some elements of the variant readings of the Oxford MS did enter my translation (interestingly the variant that Mandel considers “most significant,” the repetition of אמרו, is represented in my revised text!) of this story then. The haplography (if that be the right term for a skipped line) remained in place, although, to be sure, the flaying is indeed absent in the Oxford text, and that is an important part of Mandel’s argument as well. The repetition of the error is, to me, unaccountable. I hope that there are few errors of such a nature in others of my works but hardly imagine that none exist, much as I have tried to be careful over the years both with copying, translating, and checking manuscript variants. It is necessary to restate, however, that the skipped line does not affect my original interpretation of the text; as said above, putting it back in only enhances my reading. In the latest version of the text (the recent Hebrew translation of Intertextuality and the Reading of Midrash), the line is restored with only positive effect). The error itself is, therefore, regrettable and mortifying but not, in itself, of great interpretative significance. The argument of my various readings of this narrative (and they are in different discursive contexts and themes) stands even better once the text of the textus receptus is restored. Much of this is, therefore, a red herring that detracts from the genuine innovation of Mandel’s own case which I would now quickly lay out. Where earlier scholars in general read the story in the Bavli as we have it as representing an early (at least ideological) reality, Mandel shows that it reflects rather a later ideological reality. He does so by demonstrating that the earliest witnesses to the Bavli text read quite differently: in them, the disciples’ question is not: Is it necessary to suffer and die, Master, but rather is it necessary to read the Shema in such a condition of danger. Where some—not Boyarin as Mandel himself remarks—would have read the text as representing something about the actual death of R. Akiva and some, Boyarin, as representing fairly early rabbinic representations of that death, Mandel thus shows that in its earliest form it is considerably less martyrological in its import and that the strongly martyrological elements are later additions to the text during its transmission. Where, then, I had thought it to be evidence of a third or fourth century rabbinic contribution to a developing shared discourse of martyrology, Mandel shows, I think, that it is rather evidence for continuing later influence of Christian martyrologies on the developing talmudic text. I by and large accept this conclusion which takes Prof. Lieberman’s point from The Martyrs of Caesarea and expands it. The story of R. Akiva’s martyrdom is thus a much less apt example for an early, common, discourse shared by Rabbis and Christians in Caesarea. So be it; a fine and important conclusion. It is curious, however, that Mandel in treating only the fate of this story, completely ignores the rather significant other evidence that I have cited for early rabbinic martyrological discourse defined exactly as I have done as eroticized and even desired death for God. Within the mini-corpus of my texts on this subject, there are citations and discussions of Sifra Ahare Mot 8,3, on the “three boys,” Sifre Devarim on the death of Rabbi Hananiah ben Tradyon, and especially the Mekhilta Shirata 3 on Rabbi Akiva’s own drasha: We have loved you until death. Even without the story in the Bavli, the inference that eroticized death, a conflated eros and thanatos, was quite early found in rabbinic literature seems quite sound. (And, this, it should not be necessary to add, even without accepting ascriptions of tannaitic sayings to their alleged authors or imagining that the tannaitic midrash took shape before the late third or even early fourth century). Such deliberate, not accidental, elision of evidence is evidence of Tendenz. Mandel shows his hand when he claims that his refutation of my historical interpretation of the Bavli text destroys entire the thesis that I have developed in Dying for God and even more so in Border Lines of ongoing blurred borders between nascent Christianity and rabbinic Jews. This, I suspect, is his real target, and it is arrant nonsense. The argument about Rabbi Akiva’s alleged martyrdom is only one chapter out of four in the former book and not even mentioned (as Mandel concedes) in the latter one, in which there are a couple of hundred pages of textual evidence, analysis, and reasoning that have nothing to do with martyrology at all. Moreover, in the Hebrew publication in the Dimitrovsky volume, there is an extensive discussion of other martyrological tales from the Talmud, as well from Tractate Avoda Zara and translated from the universally acknowledged best MS of that text, in addition to the discussions of tannaitic midrash as mentioned above. There may very well be other textual errors lurking in both books, and surely other ways of construing the evidence, ones that might even convince me, as Mandel has here, that I need to revise my thesis, but invalidating one important and highly evocative piece of evidence does not go far in challenging a thesis that is argued on a much much broader evidentiary base. Mandel’s argument on this score, then, is an argumentum ad hominem (by discrediting the author of the argument and not the evidence or reasoning) and as such simply and plainly invalid. Daniel Boyarin is Hermann P. and Sophia Taubman Professor of Talmudic Culture at the University of California, Berkeley. Benjamin Isaac and Yuval Shahar (eds. ), Judaea-Palaestina, Babylon and Rome: Jews in Antiquity (Tübingen: Mohr Siebeck, 2012).